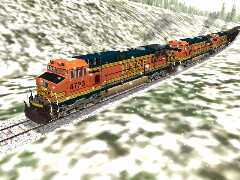 In a winter snow storm, a mixed freight triple-headed by Dash 9s, grinds its way up one of many steep grades over Marias Pass. Sitting in the cab of your choice of locomotive, haul passenger or freight to get your service to its destination on time. Along the route, enjoy the countryside or cityscape - it might be autumn or summer, raining or snowing, at any hour of day. As well as the sights, you're immersed in the sounds in your cab - clickety-clack of the rails, diesel motor working hard as you climb a steep grade, the whoosh of air as brakes are released. On a passenger train, you might prefer to enjoy refreshments and music in the lounge car. Under dynamic braking, our Dash 9s, leading a mixed freight, cross a waiting up freight. Each loco, whether diesel, steam or electric, has its own unique cabview. The major controls, gauges and dials are animated so that increasing the throttle is registered on the instrument panel, the speedometer rises and falls, the air pressure gauges move when brakes are applied and released. To help you on a trip, you can call up the Track Monitor (F4) to display speed limits, state of signals, mile posts and distance to the next platform. On a passenger service, the Next Station Display indicates expected arrival and departure times, actual times and distance to the next stop. All cabs have a view to the left and right (left and right arrow keys) and some have a head-out view (up arrow and down arrow). To help you find sidings, use the Station and Sidings display. There are other driving aids to use when you're shunting, for example. There's even a head-up display! 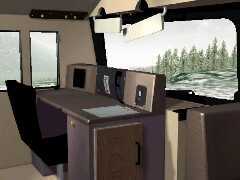 To sharpen your driving skills, this plenty of help and documentation about driving trains. There are tutorials for each route and you can simply explore a route of your own choice with whatever loco and consist you want. There are six different routes in MS Train Simulator and each has its own set of locomotives and rolling stock: heavy freight diesels, steam passenger, suburban passenger, high-speed electric commuter services, and scenic tourist railcars. With this variety, you're able to challenge your driving skills in different situations, whether it be testing your shunting skills, carrying out suburban passenger services or moving commuters from work to home. Looking out over a wintry valley, on the climb to Summit over Marias Pass. Marias Pass in northern Montana, U.S., almost on the Canada-US border, in the Rockies. The emphasis is on freight, either hauling large consists or carrying out shunting duties. North-East Corridor, Philadelphia to Washington, carrying high-speed Amtrak Acela Express commuter services. The Acela or HHP-8 locos are the same design as the European TGV high-speed locos. Innsbruck to St. Anton, Austria: here's your chance to haul the Orient Express with the Golsdorf 380 steam loco. Settle to Carlisle, UK: Drive the famous Flying Scotsman, the steam loco which held the world record for fastest train. Tokyo to Hakone, Japan: transport commuters in the electric suburban sets. Hisatsu line, Japan: drive tourists in the unique Kiha 31 diesel-hydraulic railcar. The passengers in the Superliner coaches, led by a pair of Amtrak Genesis diesels, enjoy the spring countryside. You can see a shot of one of many, many extra locos, passenger coaches, freight stock, routes, and activities available on the Web. Other pages that follow will give you plenty of download sites - in particular, what are the best locos and transets to add to your default collection. While you're deciding on what to download, make yourself familiar with Winzip, the Windows program to unpack compressed files. It's on almost every monthly computer magazine's cover CD or can be downloaded. Almost all downloadable add-ons for Train Simulator are packed with Winzip so you're going to use it extensively. Arriving at Cutbank with a heavy freight consist hauled by two hard-working GP38-2 diesel-electric locos. webWiz is running Train Simulator on a 900MHz Celeron, 512Mb memory, 20Gb hard disk, 32Mb TNT M64 graphics card and 15" monitor (sad about the latter!). Even with such a fast processor, compared with the 233MHz Pentium recommended as the minimum by Microsoft, driving can become a chore with some stuttering of the graphics when working an activity that has many AI trains running. A full install of the six routes consumes nearly 2Gb of disk space, so, by the time you download add-on locos and rolling stock, a big disk is compulsory. In any event, a computer manufactured in the last year or so will be fine. When installing, choose the default folder suggested by setup - so many downloads assume this. In other words, let the setup program put all the files in c:\Program Files\Microsoft Games\Train Simulator\. Finally, a little jargon that you'll see when browsing sites: default locos, rolling stock and routes refers to the locos, freight wagons and routes that come as part of a normal installation of the Train Simulator; non-default then refers to downloads you install from the Web; AI trains are the artificial intelligence or computer-controlled trainsets that will automatically run or stand in sidings while you're working through an activity.